Dangling in the Forward Fold Pose, or Uttanasana, is a very grounding Yin Yoga pose that can also relieve your anxiety. We often think of the Forward Bend as a hamstring opener, and it is, if done in the Yang fashion. The secret to a Yin Yoga practice is creating the "still heart," as described above! It is creating the moment to invite in all that is, instead of what we wish was! If you are unfamiliar with the contemplative practice that is Yin Yoga, click here to learn more. Yin Yoga is such a sweet practice, of long-held yoga poses to provide presence to your body, increase your health, flexibility and longevity by gently stressing your joints to increase their range of motion. When done in the Yin fashion, Dangling in the Forward Fold Pose, works less on your hamstrings at the back of your legs, and more on the spine in the lower back. It is also a compression at the waist and stomach, massaging this area as well. Dangling in the Forward Fold Pose is perhaps the easiest pose to set up. Just come to a standing Tadasana pose with your feet hip-width apart. Then, bend your knees slightly, or a lot, if desired for comfort, and bend forward at the waist. Cross your arms and take your elbows into your hands and dangle, like shown in the photo, below. By bending your knees, it takes your focus off your hamstrings and is more Yin-like. Avoid bobbing up and down while you are in the pose, but go ahead and sway back and forth a bit if this feels good to you. The swaying action may help you to ground yourself if you are unstable. The swaying helps you feel your feet holding you to the ground. Stay balanced between your heels and the balls of your feet. 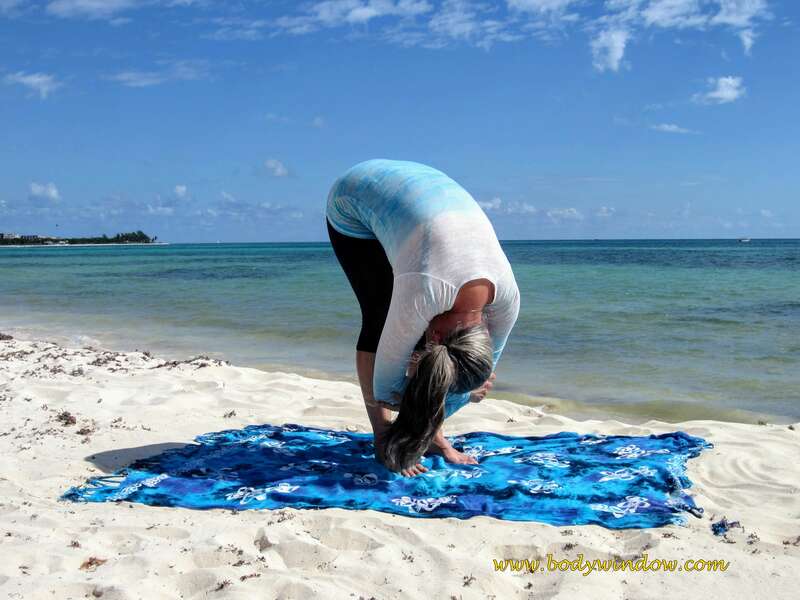 The action of this pose is to totally release your upper body, head and shoulders. Let go of all your stress, worries and thoughts of anywhere other than the sensation of the upper body release, in this moment. You are releasing through the spine, and working on the joints between the vertebrae of the lower back. I have found that nothing relieves my anxiety more than this singular pose. I focus on letting it all go, hanging there with as much stillness as I can muster. This pose may also provide relief of lower back pain and menstrual cramps. Dangling in the Forward Fold can be difficult to hold for more than a few minutes. Because your head is inverted, the rush of blood to your head and upper body may be disorienting, or cause a change in your blood pressure. If you have issues with blood pressure, you may want to test this pose first from a sitting position. 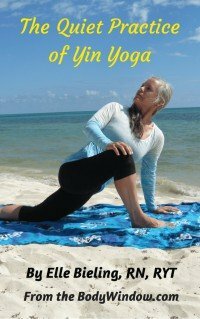 You may wish to play with straightening your knees in yang-like fashion, for a nice hamstring pull, then release your knees once again and feel the sensation of your chest moving toward your thighs. You may even wish to bend your knees sufficiently to rest your chest completely on your thighs. I love when even the yogi with the tightest legs, experiences this pose in the Yin fashion for the first time. It becomes a totally new experience, than the Yang version of trying to force your legs straight OR making the universal, but misguided attempt to touch the ground or touch your toes. The goal of Dangling is not to reach towards the ground, but to dangle in the full release of the head and upper body. By doing so, you can strengthen your 2nd Chakra healing and emotional center! When you have dangled for 2-3 minutes, unless you can totally relax the legs, do not attempt to hold the pose longer. You may wish to go from the Dangling Pose to the Squat Pose, as a counter pose for 2-3 minutes, then back to the Dangling Pose for another 2-3 minutes. To come out of this pose, you can drop your hands and slowly roll up your spine, until you can return to the standing position. May your Dangling in the Forward Fold Pose be a true time of relaxation, connection and stillness. May you find your own Peace, Freedom, and Compassion towards yourself and others, as you do this pose and heal your body-mind-soul!